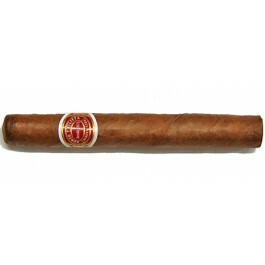 The Romeo y Julieta No.3 is a rich, mild-medium Coronitas, 4.6” (117mm) long, of 40 ring gauge, and comes in aluminum tubes in a 10 cigars box. Exclusively hand-rolled using long filler since 2002, they are also only sold in aluminum tubes. These are the shortest of the of the No. series by the brand, smaller than the more famous No.2. It has the brand's unmistakable taste, flowery and woody aromas, mixed with fruits, and sweet tobacco, with a mild to medium body. It is very aromatic and very straight forward, which makes it a perfect smoke for an inexperienced smoker or for an outdoor activity as it will remain safe and fresh in the aluminum tube.